It took me years to form the perfect nail army. I was a victim of chipping and smudged nails after my mani's but now I'm saved! First I start with Color Club nail polish as a base coat. After applying my color, I seal it with China Glaze No Chip Top Coat. I this a durable top coat that lenghtens my nailpolish wear. 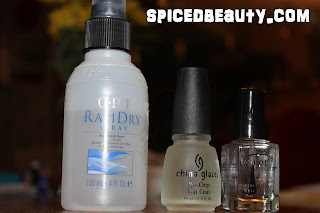 Lastly I spray my nails with OPI Rapid Dry. This makes them dry much faster! So that is my routine! What is yours? Awesome!! I rarely paint my nails now since were I work at they don't allow nail polish but I'll have to look out for the OPI Spray though. Also, your welcome of my UD BOS III swatches! im going to steal ur routine b/c nothing is working for me. i need to try the china glaze &OPI items! i always smudge my nails because i`m so impatient. Tell me how it goes Courtney & Tsahi! I have the OPI Drip Dry Drops but have had my eye on the spray for ages, I think I initially decided on the drops coz I read somewhere they dry slightly faster. The spray is on my wishlist, don't know why exactly but the spray seems more appealing to me, lol. Other than that I use CND Sticky Base Coat and Super Shiny Top Coat, still end up chipping within 24 hours but nothing bar Shellac will ever improve that department for me, haha.